Janet Holden is the wife of award-winning actor Eric McCormack. The return of her husband's show, Will and Grace, hasn't affected their family. Janet Leigh Holden was born in Edmonton in Alberta, Canada. She would go on to become an assistant director for movie and television projects in the United States and her home country of Canada. It was on one of these productions where she met her future husband. Janet Holden met her husband, Eric McCormack, on the set of the CBS mini-series Lonesome Dove in the late 80's. The two didn't marry until years later on August 3, 1997. Happy twentieth wedding anniversary to the lovely couple! The couple has one son together, Finnigan Holden McCormack (who is in the photo above with his parents). They live in Los Angeles and, true to their Canadian roots, Vancouver. Janet Holden and Eric McCormack have an estimated net worth of 15 million dollars. When the two Lonesome Dove lovebirds aren't playing with their four dogs and two cats or spending time in Canada, they are in Los Angeles. Most recently Janet Holden's husband, Eric McCormack, has been filming the return of the beloved NBC sitcom Will and Grace. There have been over 200 episodes of Will and Grace, a number which makes the couple's net worth understandable and the show has come back for more. Will and Grace coming back for a ninth season eleven years after it ended is practically unheard of in the television world. To put it in perspective, the couple's son, Finnigan Holden McCormack, was only four when the show originally ended and he celebrated his fifteenth birthday this year. There was a lot of worry and nay-sayers around the return of the sitcom but they made it work in the same way the show does anything - with lots of humor and cheek. The first episode of the new season was watched by over 10 million viewers, showing that even after eleven years fans still love the hilarious show. The hit sitcom Will and Grace has been an award-winner since its beginning. While it has never won a Golden Globe, the show has been nominated for an impressive 29 Golden Globe awards, two of which come from next year's Golden Globes. Fingers crossed for the show and for Eric McCormack, who is nominated for Best Actor in a Comedy or Musical Series! Just because the amazing television show has never won any of their nominations at the Golden Globes or from the Television Critics Association does not mean other award ceremonies have not granted the sitcom with the honor it deserves. Will and Grace has been nominated for eighty-three Primetime Emmy Awards, winning an impressive sixteen times! Along with the Emmys, the Screen Actors Guild Awards (the cast is in the photo above with their awards) has nominated Will and Grace for multiple awards. The actors have been able to win seven out of the twenty-one awards they were nominated for. Janet Holden has been a fixture on the red carpet next to her husband, Eric McCormack, for as long as they've been together. Janet Holden has been spotted at many award shows and events with Eric McCormack, showing what a wonderful and supportive wife she is. 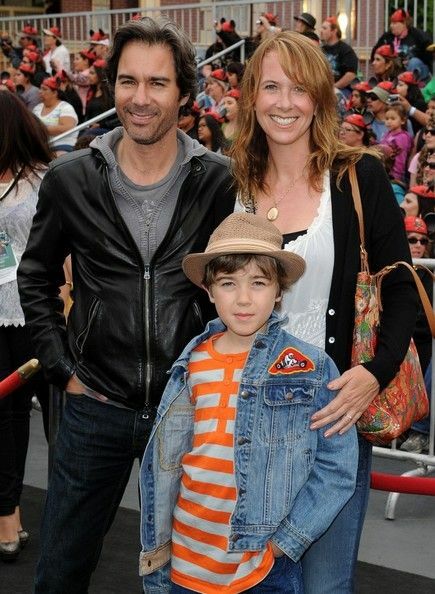 While Janet Holden doesn't have a social media presence herself, Eric McCormack is very active on Twitter. The majority of his tweets are professional, but reading through the personal ones makes it easy to tell how much Eric McCormack is loved by Janet Holden and how much she must love him. Janet Holden has been by her husband's side for years and he has been by hers. Raising a child together and the abundance of animals in their lives can really make someone jealous of Janet Holden and Eric McCormack and the love they share. That love between Janet Holden and Eric McCormack is tangible; you can see it in the way they look at each other. After twenty years of marriage, Janet Holden and Eric McCormack's love seems to be going strong. Hopefully the two will be together for another twenty years and we'll see more projects in the future from the both of them.